Torun is an ancient Polish city on the Vistula River. Tourists come here to see the remains of the fortress wall and other monuments of the Middle Ages. There are many ancient buildings in Toruń - the entire city center is included in the UNESCO World Heritage List. There is one of the largest architectural complexes of Gothic buildings in the center of the city. Most of the historic buildings are centered around the Market Square and on the streets that originate from it. Not far from the Town Hall there is a stone house in which, on February 19, 1473, Nikolai Copernicus was born. During its history, the building was rebuilt many times, but in the 60s of the last century it was restored and brought to its original appearance. Now the memorial museum of the scientist is located in this house. The Church of St. John is one of the oldest churches in the city. Gothic and baroque intertwined in its architectural appearance, baroque interiors are luxurious and the bell of this church is one of the largest in Poland called the "Trumpet of the Lord." There are the ruins of an ancient fortress of the Crusaders, on the bank of the Vistula river. 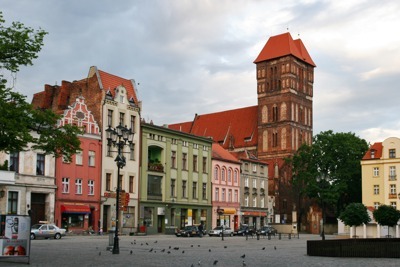 Torun may also boast of its falling tower. Built in the 13th century, it stands firmly up to now, but only its top has moved away from the horizontal by one and a half meters. 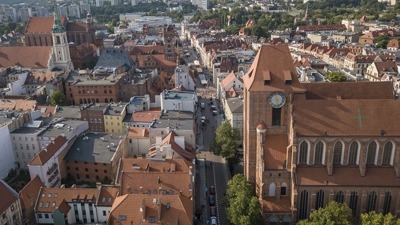 For those who want to spend an unforgettable time in the city of Torun, there is a service for ordering a car with a driver. This service includes transportation of passengers of 4 people from the airport to any place in the city or a city excursion. In order to use the services of the company one just needs to go to the 8rental main page and order, one of the cars presented and available there. Depending on the wishes of customers, the driver will transport them wherever they need to. Just send us a quote right now and state all your requirements so that we will provide you with all that you need during your trip in Torun. Chic and fast cars are the main advantages of the company. They are all not only very luxurious and new but they are also secure and each is equipped with the most necessary amenities that every tourist of the company will highly appreciate. Thanks to the reliability of the car and the conscientiousness of the company's employees, passengers feel very comfortable and incredibly safe in our cars. The chauffeurs driving the cars for this service are very serious and punctual people. They always work at the highest level and provide quality services for all passengers. They take care of the safety of all tourists and provide them with high comfort during the whole time of transportation. Moreover, as we are concerned with our customers' full satisfaction, all our drivers speak several international languages. We want to make sure that you will always come back to us when in Torun.